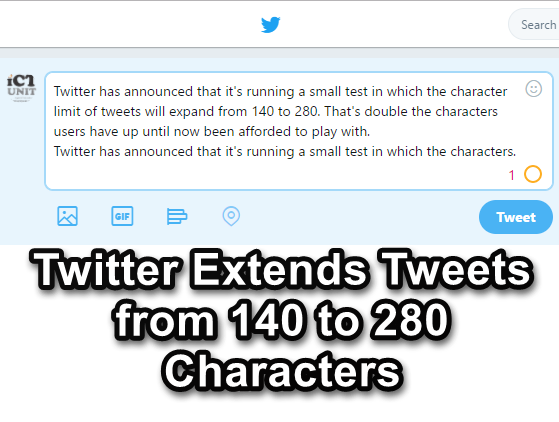 Twitter has announced that it's running a small test in which the character limit of tweets will expand from 140 to 280. That's double the characters users have up until now been afforded to play with. The reason for the change, Twitter explains in a blog post, is that in some languages, namely Chinese, Japanese and Korean, users are able to convey a message with fewer characters. In other languages, such as English, it typically takes many more characters to express the same message. Twitter has found that just 0.4% of tweets in Japanese hit the 140-character limit. By contrast, 9% of tweets in English do. Most tweets in Japanese are 15 characters long, Twitter said, while in English, tweets average 34 characters. Twitter's change is about giving all users around the world ample room to tweet, which should lead to an increase in the number of tweets being sent overall. "Our research shows us that the character limit is a major cause of frustration for people Tweeting in English, but it is not for those Tweeting in Japanese," Twitter said. "Also, in all markets, when people don’t have to cram their thoughts into 140 characters and actually have some to spare, we see more people Tweeting – which is awesome!" The extended character limit is being tested in all languages "impacted by cramming", Twitter said, meaning Chinese, Japanese and Korean won't be included in the test. Twitter maintains it is still all about brevity, and that a 280-character limit allows it to keep delivering information in bite-size posts. TechRadar editor John McCann is one of the lucky ones to have been included in Twitter's test. He notes there's a new icon to show you when you're nearing the 280-charcater limit. A circle next to the "Tweet" button fills up as you type, turning orange and displaying a countdown as you reach the limit and red when you've gone over.